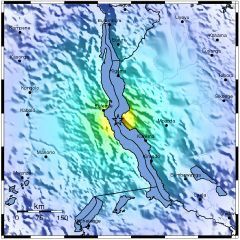 Kathryn Cramer points to a USGS “ShakeMap” of the magnitude-6.8 earthquake that struck the Lake Tanganyika region today, and has provided a Google Earth overlay of it as well. This was my first exposure to the USGS ShakeMaps site, which provide maps of major earthquakes around the world; there’s an extensive archive. Noting for future reference.